School's out and life just gotten a whole lot more complicated. On the plus side, the weather's cooperating. Most moms I know are frazzled from keeping the kids entertained. Meanwhile, I'm running ragged from swimming lessons, never-ending playdates and various other social engagements. Little L's in seventh heaven claiming everyday being a wonderful day. I think we might as well camp at the park seeing that we're there pretty much everyday. We've had streams of visitors coming and going at our place. I thought it's the perfect opportunity to make a large batch of pesto. The weather's getting hotter and more humid by the day. I'm done with slaving away in the kitchen so this is the perfect alternative for a meal. 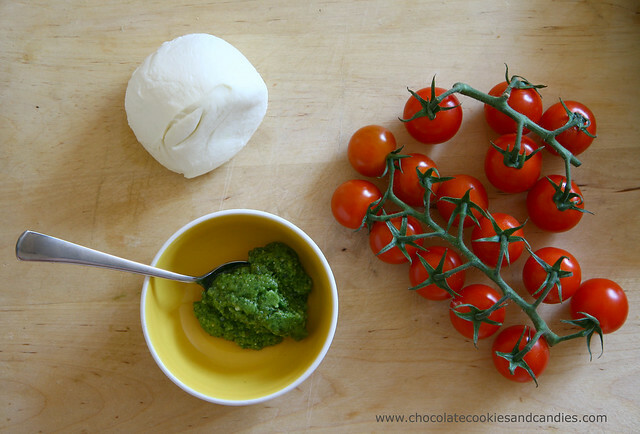 It's cheap, scrumptious and a medium sized container of pesto can feed a crowd. 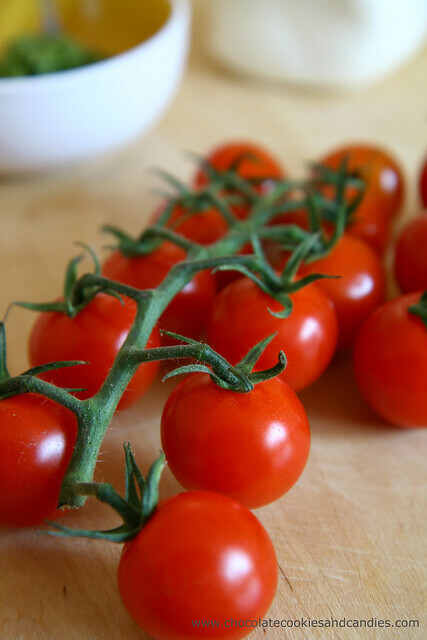 Right now, sweet and juicy tomatoes are in season which means we've been having plenty of insalata caprese. Yum yum! I love insalata caprese! Made some the other day, or rather assembled some, with plenty of torn basil. Look, your life can't be more complicated than mine. Little A is mobile. And when i say mobile, I mean MO-BILE! She zooms around all over the place while screeching at the top of her little lungs. I'm bound to get a sore back from constantly picking her up and putting her back to where she's supposed to be. She is also extremely fascinated by the wires around the living room and likes to chew on the rug. Yep - the dirrrty, most probably dust-mite ridden rug. Oh, and she loves munching at the heavy doorstopper in our living room so the door now has to be shut most of the time (I'm not chasing her down the hallway and I don't care if people think our flat is just a small hole - she can stay right in the living room!!! )Did I mention that she prefers knives and forks over toys? The shinier the better. I think I'll just add that she decided to 'assert her independence' (or whatever they'd like to call it) and reject spoon-fed solids for what...a month now??!! Wait, it's not all bad - Little A is quite a talented artist. She likes to paint. Her specialty is edible abstract art - on the floor, the table, the high chair, sometimes she likes to use me as a canvas. Camping at the park isn't looking so bad now, don't you think? I'm in love! This is a favorite meal of mine. 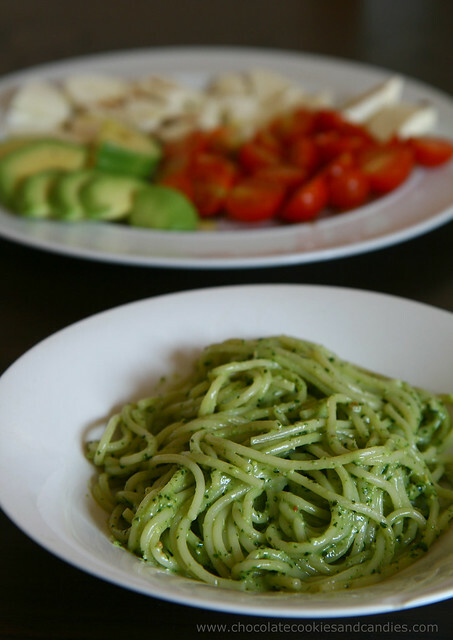 Most of the time, however (I can't believe I"m admitting this "out loud") I make pesto with fresh coriander, rather than with basil. I love it more! :) Enjoy all your busyness! So simple and fresh - yum! Gosh your photos are always so amazing and crisp and clear - you are a great photographer! FrustratedWalrus, if you think that's bad, you wait till the terrible 3s. The terrible 2s is nothing! I can only feel sympathy. Been there done that and will NOT do it again. AA, I must try coriander because I love the herb particularly in curries. Lauraloo, the heat has been pretty stifling but no worse than the US. Katherine, awww, so sweet of you! the photo of the tomatoes...truly amazing! YUM YUM!! That looks amazing! Thanks, Terri! It's actually pretty hard to capture reds on my camera. I can't wait till I upgrade my gear. It's nearly considered obsolete. YUM! I had a caprese salad with grilled eggplant saturday night and it was delish. I love a good, fresh tomato.